Hello and Welcome to Multus SDR, LLC. Multus SDR, LLC. offers a line of ham radio equipment at a very affordable price. Our Proficio Transceiver (160M-10M, 5W) is the best value in ham radio transceivers. Using SDR as an enabling technology, the Proficio offers high performance at a very affordable price. 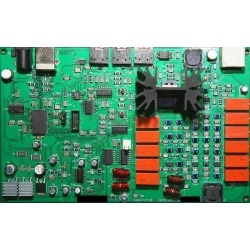 We believe our transceiver kit when used with our MSCC-Core custom host application, is the easiest to use SDR transceiver available in amateur radio market. Building, installing and using our transceiver is plug and play. There are no cumbersome and confusing configurations to deal with. "High Performance at a low cost"
Please take a look at our products. We offer everything needed to assemble a ham radio station.